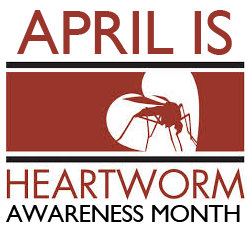 April is heartworm awareness month. Heartworm disease is a serious and potentially fatal condition caused by parasitic worms living in the arteries of the lungs and occasionally in the right side of the heart of dogs, cats and other species of mammals, including wolves, foxes, ferrets, sea lions and (in rare instances) humans. Heartworms are classified as roundworms and are filarids, one of many species of roundworms. Dogs and cats of any age or breed are susceptible to infection. 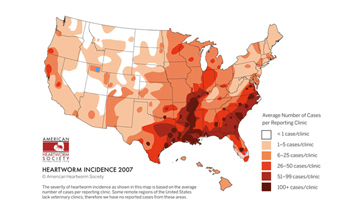 Heartworm disease has been reported in all 50 states. The map below shows particularly endemic areas based on the number of cases reported by clinics. First, adult female heartworms release their young, called microfilariae, into an animal’s bloodstream. Then, mosquitoes become infected withmicrofilariae while taking blood meal from the infected animal. During the next 10 to 14 days, the microfilariae mature to the infective larval stage within the mosquito. After that, the mosquito bites another dog, cat or other susceptible animals, and the infective larvae enter through the bite wound. It then takes a little over 6 months for the infective larvae to mature into adult worms. In dogs, the worms may live for up to 7 years. Microfilariae cannot mature into adult heartworms without first passing through a mosquito. For both dogs and cats, clinical signs of heartworm disease may not be recognized in the early stages, as the number of heartworms in an animal tends to accumulate gradually over a period of months and sometimes years and after repeated mosquito bites. Cats may exhibit clinical signs that are very non-specific, mimicking many other feline diseases. Chronic clinical signs include vomiting, gagging, difficulty or rapid breathing, lethargy and weight loss. Signs associated with the first stage of heartworm disease, when the heartworms enter a blood vessel and are carried to the pulmonary arteries, are often mistaken for feline asthma or allergic bronchitis, when in fact they are actually due to a syndrome newly defined as Heartworm Associated Respiratory Disease (HARD). Heartworm infection in apparently healthy animals is usually detected with blood tests for a heartworm substance called an “antigen” ormicrofilariae, although neither test is consistently positive until about seven months after infection has occurred. Heartworm infection may also occasionally be detected through ultrasound and/or x-ray images of the heart and lungs, although these tests are usually used in animals already known to be infected. What should you do to protect your pets? Because heartworm disease is preventable, the AHS recommends that pet owners take steps now to talk to their veterinarian about how to best protect their pets from this dangerous disease. Heartworm prevention is safe, easy and inexpensive. While treatment for heartworm disease in dogs is possible, it is a complicated and expensive process, taking weeks for infected animals to recover. There is no effective treatment for heartworm disease in cats, so it is imperative that disease prevention measures be taken for cats. There are a variety of options for preventing heartworm infection in both dogs and cats, including daily and monthly tablets and chewables, monthly topicals and a six-month injectable product available only for dogs. All of these methods are extremely effective, and when administered properly on a timely schedule, heartworm infection can be completely prevented. These medications interrupt heartworm development before adult worms reach the lungs and cause disease. Consult with your veterinarian about the best prevention program for your pet. This entry was posted on Thursday, March 28th, 2019 at 8:03 am	and is filed under News & Updates. You can follow any responses to this entry through the RSS 2.0 feed. You can leave a response, or trackback from your own site.